Trena loves to ride horses. We can't afford to board one so she settles for weekly lessons. Once in a while we get the chance to ride a school horse in a show. 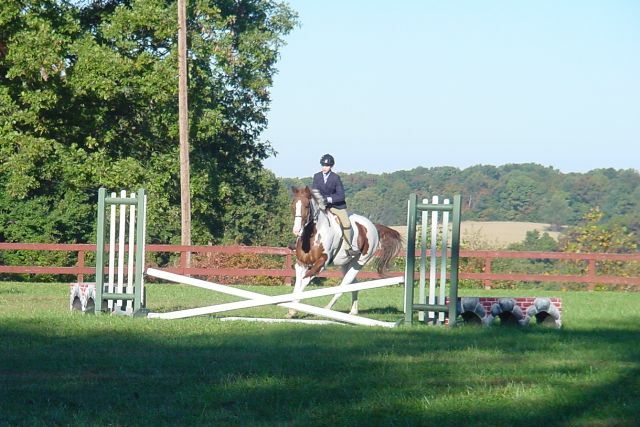 Here is Trena in the summer of 2004 on Moon at Lehigh Riding Club in Westminister. Note to digital camera users. It takes LOTS of practice to get a good picture like this. This was on of the best of some 60+ pictures I took that day. My technique involves focusing on the jump, setting the zoom to frame the picture and letting the camera figure it's white balance. While still holding the button in half way I pan back to the rider and follow her back to the jump. Just as the horse approaches the jump I trigger the shutter and the camera finally captures the image as the horse crosses the jump. Oh yes follow through and the horse and rider will hopefully be sharp while the background and jump are sacrificed to motion blur.